Learn how to log into HubSpot, reset your account password, or reactivate an account. If you use a Google account to log into HubSpot, click Sign in with Google, then follow the prompts to log into your Google account. If you're an Enterprise user with single sign-on (SSO) enabled, click Log in with SSO, then follow the prompts to log in with your email address. If you have two-factor authentication enabled, verify your login (mobile device with SMS or Google Authenticator) to access your account. If you need to reset your password, click Forgot my password on the log in page and follow the steps to reset your password. Learn more about resetting your password in HubSpot. If you still aren't able to log in after resetting your password, follow these troubleshooting steps to resolve the issue. A free account will be deactivated if you don't log in or use your HubSpot tools for more than 120 days. If your account is inactive for 90 days, you'll get an email notification. To make sure your account stays active, click Sign in and log into HubSpot. 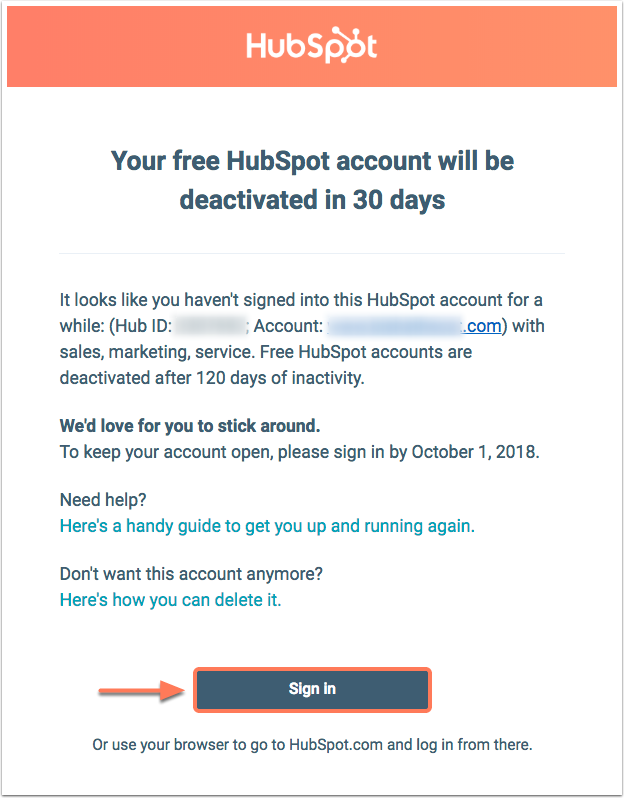 If it's been more than 120 days since you've logged into HubSpot, you'll no longer have an active account. 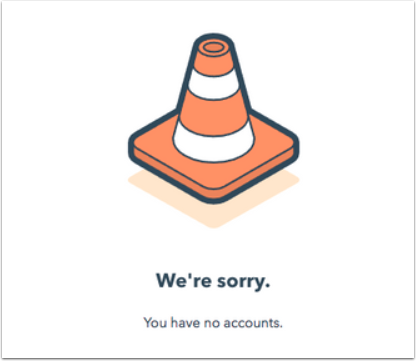 When you try to log in, you'll get a message stating: You have no accounts. To recover your deactivated account, submit your information to the Community team through the linked form below. Make sure that your browser is supported by HubSpot. Manually visit login.hubspot.com and try to log in. If you have multiple email addresses, ensure that you're using the email address associated with your HubSpot account. Clear the cache and cookies in your browser and retry. Check status.hubspot.com to see if there's a known login issue. HubSpot will continue to update this page with any new information. Try logging in from another network (e.g., from the cellular network on your smart phone) to see if the issue is network-related. If you are able to log in from another network, contact your IT department or network administrator. Click this link to log out of your HubSpot Sales account. Retry your login on app.hubspot.com/login/sales. In the upper right-hand corner of your Chrome browser, click the three vertical dots . Click Advanced to expand the section at the bottom, then click Content settings. Ensure the Block third-party cookies switch is toggled off and that the Allow sites to save and read cookie data (recommended) switch is toggled on. Please note: only HubSpot customers, free users, or trial users can log into HubSpot. If you signed up to receive an ebook or registered for a webinar, but don't have an active account, you won't be able to log in. If you're unable to log in after following the steps above, click here to submit your information. Submit your email address below to get additional login help via email.